Five years ago Kiersten Greeson was looking for a way to honor her hero, mentor and friend, dairyman Eddy Boertje. Boertje had been diagnosed with blood cancer. 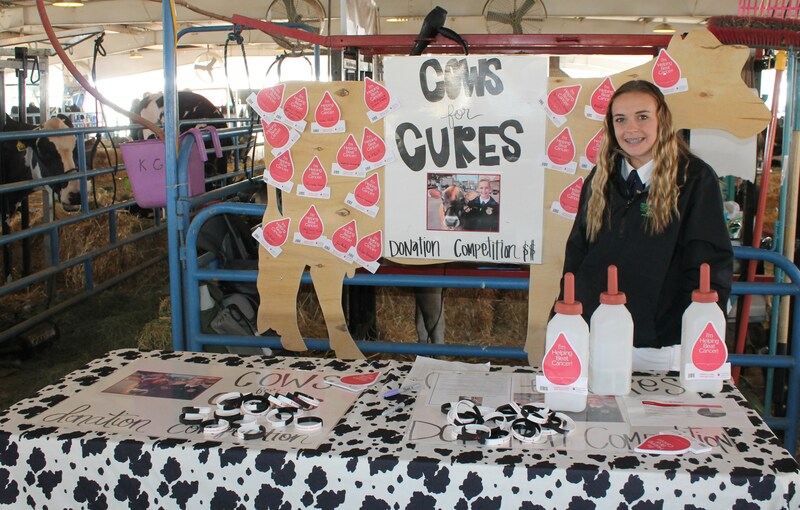 Struggling to find a way to help, Greeson, a young dairy exhibitor, started donating 10% of her 4-H heifer sales to the Leukemia and Lymphoma Society (LLS). She subsequently started her project, Cows for Cures. “He’s an inspiration to my campaign because he has never given up and he still goes out to the dairy every single day to work,” Greeson said. Greeson has been showing dairy cattle for about eight of her 15 years. Her family does not own a dairy, but she has a passion for cows and the dairy business. At the recent Western Classic Dairy Show, Greeson not only had a couple of her own Jersey heifers to show, but also a couple of Boertje’s Holsteins. Greeson has been nominated as a candidate for the LLS’s Student of the Year. 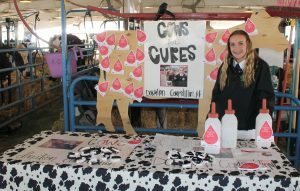 With her Cows for Causes campaign she is in a seven-week competition to raise as much as she can for blood cancer research. The competition with other high school students ends Friday, April 6. She is the only South Valley student ever be nominated, she said. The winner earns a scholarship toward college tuition. “However, EVERYONE is a winner when cancer loses!” she states on her campaign flyer. Greeson has set a rather lofty goal of $100,000. She points out that 85% of funds raised goes toward research and affordable treatments, travel help, co-pay assistance and support services. Greeson sees her future in the dairy business, “for sure.” She is happy to share that her friend, Boertje, is currently in remission. We hope the best for you. The research for cures and treatments for cancer for everyone need people like you to bring attention to this cause that directly effects so many people. There are so many areas in agriculture to explore for someone as interested as you have been. Keep up the great work you are doing. We thank you as we cheer you along on this journey.